Trusting the wrong company with your exhaust cleanings can land you in hot water with the fire code inspector or even lead to a fire at your restaurant. Fortunately, you can trust Flue Steam to provide the thorough restaurant kitchen exhaust cleaning in Burbank CA you need to satisfy code inspectors, eliminate fire hazards, and keep your kitchen smoke- and odor-free. At Flue Steam, we know that no two restaurant kitchens are going to accumulate grease exactly the same way. That’s why we let you tailor your service to get just the right amount of cleaning to stay on top of grease buildup in your kitchen. Most clients end up getting hand scraping every month to control grease on exhaust hoods, and steam cleaning 2 to 4 times per year to reach hidden grease deposits way up in the ductwork. Our techs can measure grease depths to help determine how quickly grease accumulates in your kitchen and make sure you are getting restaurant kitchen exhaust cleaning in Burbank CA before you have a fire hazard on your hands. After providing service, our technicians will provide you with a Certificate of Performance sticker. These stickers include the date of service to help you keep track of your cleaning schedule, and to confirm to code inspectors that your kitchen is in compliance. Exhaust fan inspection: As a courtesy to our clients, we always inspect the exhaust fan when providing restaurant kitchen exhaust cleaning in Burbank CA. We grease the fan bearings and we can even replace the fan belt if you have spares on hand. Swamp cooler service: We can inspect, drain, clean, and refill your swamp cooler every six months to help promote uninterrupted service. 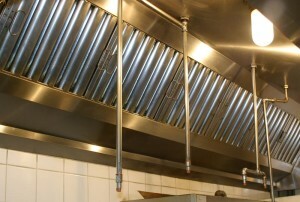 Can’t remember the last time you had restaurant kitchen exhaust cleaning in Burbank CA? It’s time to call Flue Steam. We can have a crew at your restaurant ASAP. Please call 800-700-FLUE now to schedule service.